you can click on the link above to read the text, courtesy of Oremus Bible Browser. There’s a famous commentary on Mark’s Gospel by Ched Meyers, called, “Binding the Strong Man.” In it Meyers emphasizes the thread of Jesus’ authority and his power against the systems of the world throughout this Gospel. This early in Mark’s story, we see the chaos Jesus is causing by his radical inclusion of people who would have been excluded from the Church community of his day. He is healing people whose chronic defects like demon possession and withered limbs are customarily thought to be a curse. The heavyweight religious authorities are pretty sure he his theologically out of bounds. If people who are cursed are included in the community, won’t the whole community be contaminated? He himself must be cursed to have the power to do all these forbidden things. Jesus just laughs at their ridiculous accusation that his power is from Satan himself. He claims instead to bear the very power that can overcome the sicknesses and curses of an evil world, the power of God’s saving grace for all people. He tells them that they are blaspheming to deny the power of God’s Spirit among them. A pretty dramatic claim. Jesus stands against the system of privilege and power of his day, and of every day, claiming that the man-made rules that exclude people because they do not meet the norms of the day are the true evil, and that God sent him to overcome such divisions. We will see the price he pays for such radical inclusion as his own church conspires with the government to put an end to the chaos he causes. But we see that God’s power is made complete in Jesus’ resurrection, the seal upon his work to bring equality and justice to the world through those who believe his message and live according to his dramatic view of who is included in God’s kingdom. What struck me in this reading today is the story of his family, and his seeming rejection of them. They are obviously worried about him. Whether they are afraid he’s lost his mind and doing crazy things or whether they think he’s crazy to mix it up with the powerful theologians of his time is a good question. Either way, they’ve come to carry him off quietly. But Jesus is having none of it. He declares that those who are with him in his quest to change the world through the power of God’s love are his real family. Maybe a little extreme. Maybe even hurtful. But I’d like to propose that all of us are included in that family that Jesus is claiming beyond his mother and brothers and sisters. When we baptize babies and carry them out into the midst of our congregation, we tell them that this is your other family, your church family. Our Sunday School kids are taught to think of us as their church family, a place where people completely unrelated to them will provide for their spiritual education, support their life of faith, and watch them grow with deep concern for their welfare and their future. This morning we celebrate some of our kids and bless them on their way in life. 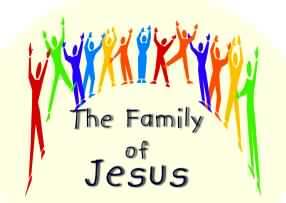 We are not just ‘this family’ at Our Savior’s, we are part of a larger family in time and space. We live by another standard than that of blood relationships or neighborhood loyalties, we live out of a love that has invited us into community with Jesus himself, and turned our hearts to see the world differently. In Jesus’ family, we notice how resources are hoarded and reserved for the privileged, and the powerful systems that keep some people from access to equal opportunity. In Jesus’ family we fight to make systems more equitable, and to lift those without privilege to help them join the mainstream. Our faith family is a place where doubt and fear need not be hidden, because we care for each other and hold each other in prayer. Our faith family welcomes us as we are, opening their hearts to the gifts we bring at God’s invitation to make the community into the Body of Christ in this place. I don’t mean to glamorize our faith community beyond recognition. But the church has been my refuge and my home for my whole life. My Dad never turned down a promotion, no matter where that sent us. So we moved a lot. We’d arrive in our new home on a Thursday and be at church on Sunday morning. It was our entry into our new community, and the place we turned for friendships. What I found was that the people I met there shared my love for Jesus as the center of who I was and how I lived my life. My love for God was nurtured in a dozen congregations, and the values of honesty and care for others were shaped there. It was in church that I learned that the power of God’s love is not just personal, but meant to change the world into a world that echoes what God loves. It was in church that I learned what a small number of people who care about something can do to change a situation. It was in church that I learned that God’s love puts you side by side with people you need to get to know more about in order to enrich your life and open the doors of your heart. It was in church that I found my own gifts of prayer and encouragement, and that I found the courage to dare a life-change based on the invitation to live those gifts. This morning Jesus says to us: “here are my mother and brothers and sisters.” It is not because we are smart or powerful or so beautiful that we have been included in this family, but because we are loved and invited. May the love that has called us to be that family also empower us to live out of the love that only God can give. Amen.